Knap Hill and Exbury Azaleas are by far the most popular of deciduous, hybrid Azaleas grown in North America. They were originally developed in about 1870 by Anthony Waterer at his nursery in Knap Hill, England, but the plants did not become widely available until 1924. Exbury hybrids are upright shrubs that normally grow from 4 to 6 feet tall but some can reach 12 feet in height, and about 4 to 5 feet in width. They bloom in late spring or early summer, producing clusters of 7-18 large, 2"-3", often very fragrant, often bi-colored flowers in shades of yellow, orange, pink, red and white. In the fall, the foliage of Knap Hill and Exbury Azaleas turns red, maroon, orange or golden yellow. Knap Hill and Exbury Azalea plants are hardy in USDA planting zones 5-9. 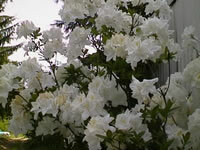 In warmer areas, plant your Azalea where it will receive afternoon shade. They will not grow very well in hot summer regions. 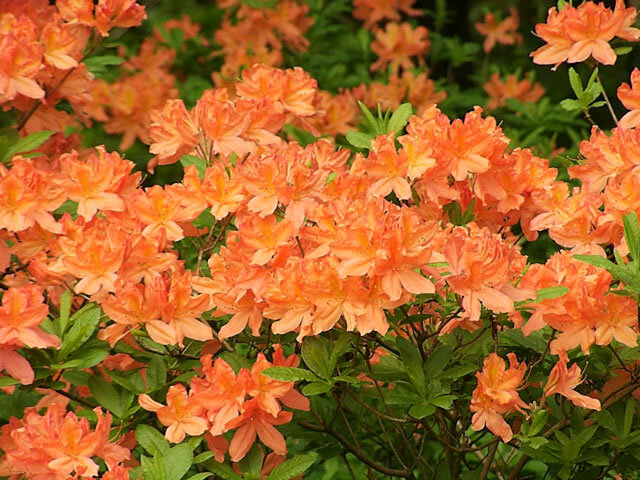 Deciduous Azaleas can be grown in full sun or light shade, but they require considerably more water in full sun. Water thoroughly on a weekly basis during the first growing season to establish a healthy, deep root system. 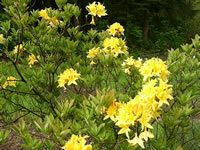 Both Rhododendrons and Azaleas must be planted in well prepared, reasonably moist but well drained soil. Mix in a generous amount of peat moss, leaf mulch and compost to the soil at planting time. Test and adjust the soil acidity to maintain a pH of 4.5-6.0. Provide a thick layer of mulch to help keep the roots cool and preserve moisture. 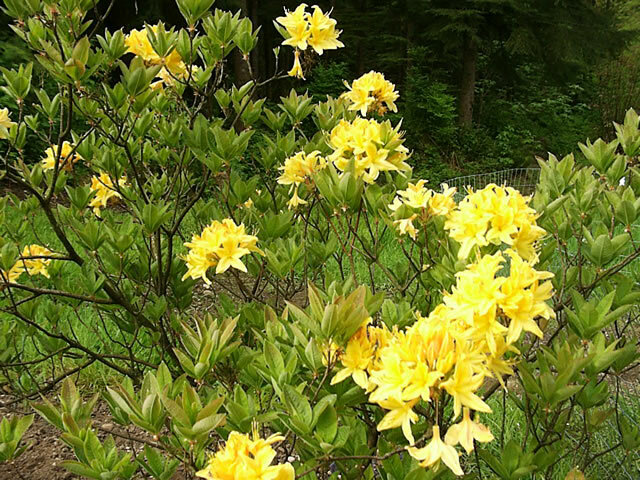 Feed yearly after flowering, using using a Rhododendron or acid type fertilizer. Generally, deciduous Azaleas do not require a lot of major pruning other than removing the spent flowers. Any serious pruning to maintain a desired size, or cutting back of longer branches that spoil the symmetry should be done right after the plant finishes blooming. A light yearly pruning will help to stimulate a greater number of flowers for the upcoming year. Deciduous Azaleas can be propagated with softwood stem cuttings taken in early spring. Dust the cut end with a rooting hormone. Maintain a temperature of 75° in the rooting medium and mist daily or provide a terrarium type atmosphere until all danger of frost has passed in the following spring, when they can be planted in the garden. An easier method or propagating clones of your Azalea is by simple layering. Pin a low growing stem into a shallow trench, using a piece of stiff wire bent into a U to hold it in place. Bend the last 6 to 12 inches of the stem upward, sharply and nick the bark on the underside of the bend. Dust the nicked area with a rooting hormone. Cover the pinned area with soil. Provide a stake to hold it in place. Once the layer is well rooted, it can be severed from the parent and moved to another part of the garden. 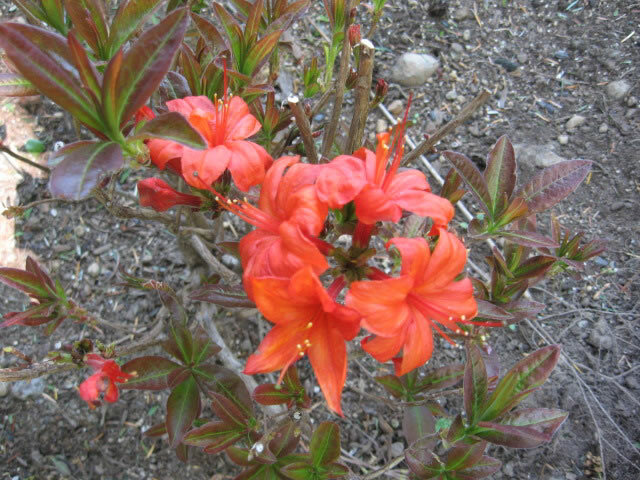 Azalea seeds require light for germination, so do not cover them! I recommend that you start your seeds indoors in early spring. Maintain a temperature in the growing medium of 55°-60° until germination, which takes about two months. Protect seedlings and young plants from direct sun.